That was the running theme for this whole book, for me. I'm not a typical romance reader, but this was romance/thriller/apocalypse and came highly recommended, and I'm glad I gave it a shot! The plot twists were like riding an old-school rollercoaster; you'd think you knew where things were going, then whipla, you're onto something else. That's what is both good and bad about this book. I love the concepts here. A curse/plague spreads globally, very fast, mutating so scientists can't get a grapple on a cure. At the same time, magic starts to spread through the land, creating beauty and power in new and mysterious ways. Great premise! So much potential. I loved the big ideas here, but then--maybe because I came to this as a fan of apocalypses rather than romances--I had a lot of pragmatic questions that were brushed aside. It also felt like the pacing was weird; things were slow at the beginning, but toward the end of the story I felt like things were being "said" not "shown," in a much more creator-speaking-to-reader-just-go-with-it kinda way. I get that some of it is supposed to be jarring--it's an apocalypse! But it sometimes felt like Roberts didn't feel like really committing to the ick of the storyline, so she'd sort of zoom in and out to focus on the bits she cared about. I also felt like the pregnancy plots would be really annoying to any pregnant woman or mother of infants. There's a woman with three infants who never so much as blinks at having to keep them all fed in the middle of a disease-filled wasteland. There's personal strength and then there's that insanity. A lot of the magic also tended toward the deus-ex-machina level; boom, magic fixed that problem, move on, let's not stop to think about the fact that this woman just sprouted wings. And, as a fantasy reader who is used to "elf" and "fairy" being a literal race/species, it was a little weird for humans to start describing themselves as these without any explanation whatsoever (at the very least, I'd have liked a clarification: are we talking Christmas elf or Lord of the Rings elf here? It matters!). Also, she spells magic "magick" the whole time and that drove me nuts. But I liked the story, broadly speaking, and I hope it's an entrypoint into fantasy and dystopian fiction for the romance-lovers out there. Unfortunately, the dissonance on some of the ideas was a little too much for me, so this is the last I plan on reading of this series. 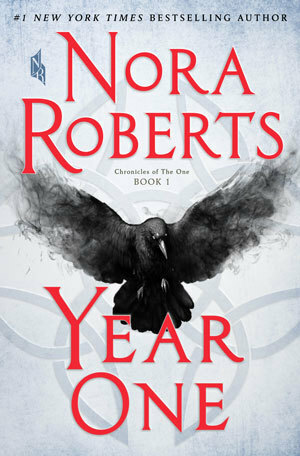 Sign into Goodreads to see if any of your friends have read Year One.